Better than expected reported comp results and improving forecasts bolstered 4Q outlook from December. Of the 6 chains that have reported so far, 5 have exceeded initial forecasts & the forecast improved for 10 additional chains while only 2 were lowered. Notably, the recent government shutdown delayed new retail sales data. 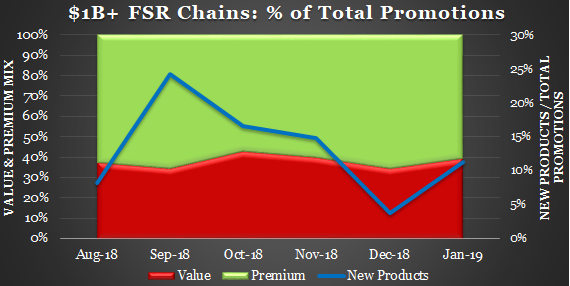 QSR value mix decreased by 220 bps m/m to 51.4% in January (vs 60.7% during 1/18) with the use of fewer price specific promotions (although delivery discount deals were up sharply around the Super Bowl). Notably, discounts tend to be highest in January after the holidays. 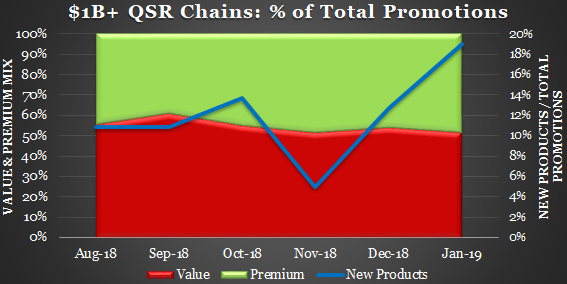 QSR product innovation has accelerated over the last 2 months to a 19% mix (with a notable increase in the coffee/bakery segment) which is further evidence of the industry pivoting away from discounting. 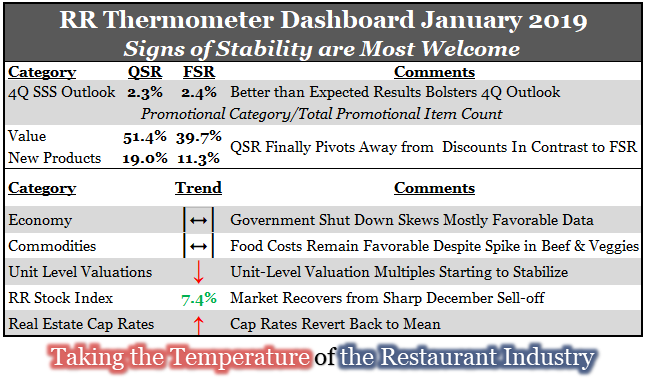 ​FSR value mix ramped up 510 bps m/m to 39.7% in January and is 360 bps above the LTM average as casual moves in the other direction of QSR. Innovation picked-up in both the family & fast casual segments. 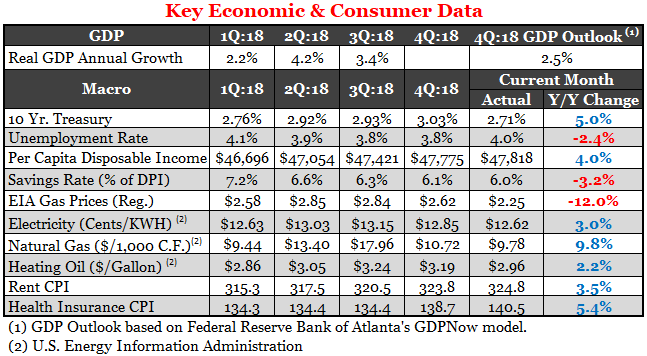 4Q GDP growth outlook was trimmed again slightly to 2.5% as economic activity continues to decelerate from 4.2% in 2Q to 3.4% in 3Q. Pros: increasing disposable income; lower tax rates; falling gas prices; and m/m decline in interest rates (FED becoming more accommodating). Cons: up-tick in unemployment rate (reflects impact of government shut-down) and waning consumer confidence (down ~13% from 10/18 peak), although these should be temporary given the sharp rebound in the stock market and drop in volatility. The BLS Foodstuffs Index declined for the 4th consecutive month on a y/y basis and the 2019 USDA outlook is favorable. 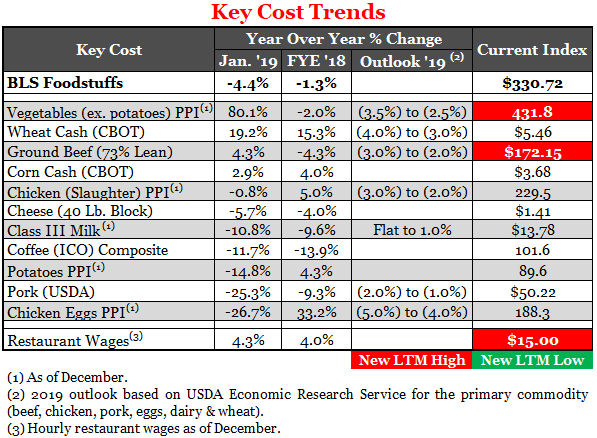 Notably, ground beef hit an LTM high in January although the 2019 outlook calls for -2% to -3% deflation. Fresh vegetable PPI surged +80% y/y, reflecting the cold snap in November (see weather chart below). 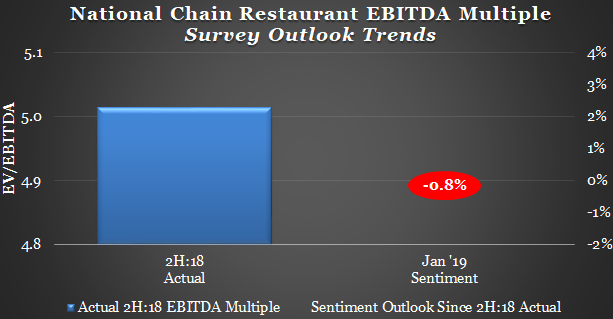 Slight pressure on franchisee EBITDA valuation multiples reflect the impact of rising wages on margins somewhat off-set by the recent m/m decline in interest rates. Sharp stock market recovery in January recoups most of December's dramatic sell-off. 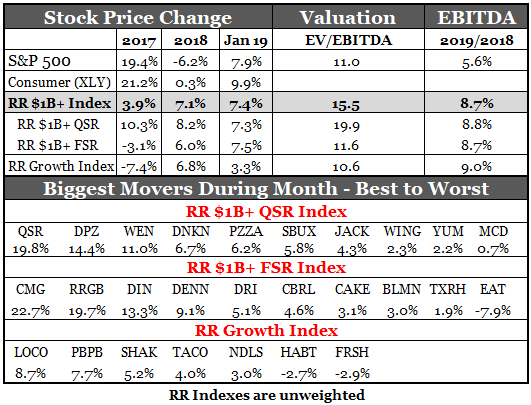 While the RR $1B+ index is keeping pace with the S&P 500 so far, the smaller growth restaurant stocks were not as popular in January. 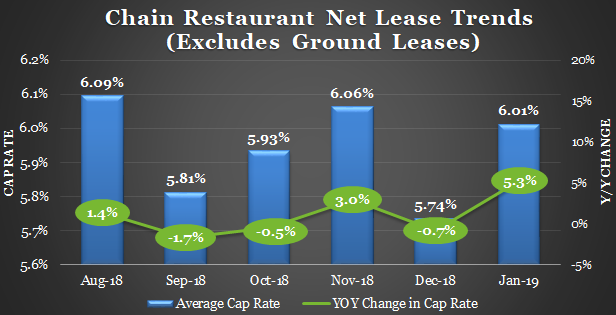 Cap rates jumped in January to the LTM average despite a decline in interest rates and a sharp drop in transactions (-43% y/y) reflects less interest in this asset class as the stock market rebounded.